Blazers are a must have, and I think its important to have a few other colours apart from the basic black. 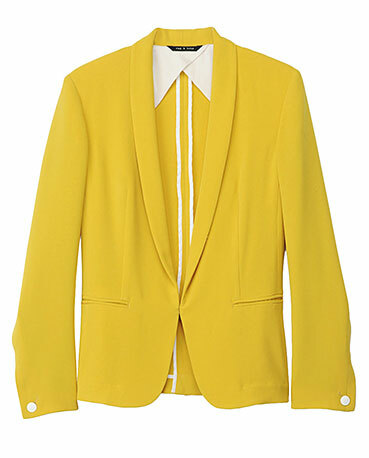 Wear this seasons brightest trend; the yellow blazer. 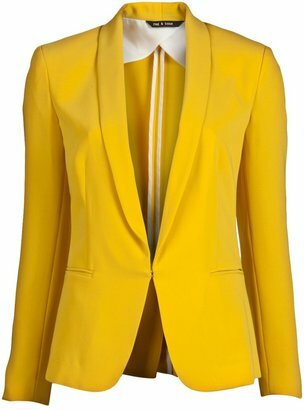 Every one from beyonce to Kim K have been spotted rocking this blazer which gives any outfit an A-list look. Beyonce showed just how fab new moms can look. She was seen front row at a basketball game wearing a pair of dark wash skinny jeans, loose white tee, Rag and bone yellow blazer with sky high Christian Louboutin Daffodile Heels in the Panama Geometrico print. Hillary Duff wore stretch maternity t-shirt and comfy black leggings. She kept the look smart by wearing her Stella McCartney yellow blazer with Alexander McQueen silk scarf and open-toe ankle booties by Maison Martin Margiela. She topped off her look with a pair of chic Gucci aviator sunglasses. keep the look sophisticated with a leopard print clutch or a printed silk scarf. It also goes well with pencil skirts; wear it to work with a lacy blouse and pencil skirt for a chic and fashion forward look.